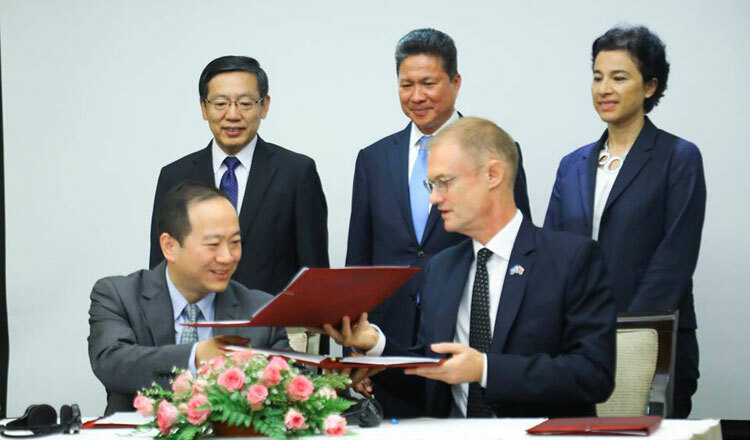 The United Nations Development Programme (UNDP) and Shenzhen 4PX Express Co., Ltd. signed a Memorandum of Understanding (MoU) and co-financial agreement on “Linking Cambodia: Together Towards Digital Economy” in Phnom Penh early this week. The signing ceremony was presided over by Senior Minister and Minister of Public Works and Transports H.E. Sun Chanthol, French Ambassador to Cambodia H.E. Mrs. Eva Nguyen Binh and Chinese Ambassador to Cambodia H.E. Wang Wentian. The signed documents aimed to promote and enhance cross-border e-commerce trade within Cambodian marketplace and to build capacity of small and medium enterprises (SMEs) in the region in order to showcase their products to the world through Alibaba global e-commerce platform in cooperation with the 4PX Express, part of the Alibaba Cainiao Logistics Group, said H.E. Sun Chanthol. H.E. Senior minister highlighted the Royal Government of Cambodia’s efforts, through the Ministry of Public Works and Transports and the National Council of Logistics, in diversifying transportation infrastructure to make it well-connected to various regions and the world, to build centres and warehouses with international standards, and to facilitate the legal procedure of relevant administrative documents in order to better facilitate the flow of goods transportation and services of those companies. H.E. Sun Chanthol also called for consideration of changing from “V Buy” to “V Buy and Sell” platform on grounds that Cambodia can both buy products from other countries and sell its products to the world through this platform. Besides, he mentioned about the potential of Kampong Chhnang province for investment thanks to its close distance to Phnom Penh capital, its airport, waterway, railway and highway availability.